Are you nearing retirement...how will you fill your days? When we consider retirement we often dream about how we will fill our days. It is natural to consider new options: volunteering for a cause that interests us, exercising a bit more by joining a neighbor for a daily walk, taking up a new hobby that we haven't had time to do before, spending more time with our family members particularly our grandchildren or siblings, perhaps committing to reading more, or even taking trips that we have put off due to lack of time. Retirement can be filled with new adventures. However, some new retirees find themselves being bored, they miss socializing with their former co-workers, they miss managing their own business and suddenly they may find that they are drawn to visit the local casino for fun and excitement. Depending on your age you may not know that up until 1978 gambling was only legal in the State of Nevada, specifically Las Vegas. So to legally enjoy gambling people had to plan to visit Las Vegas and they may need to plan for many months or even years to make that "once in a lifetime" trip to Las Vegas. 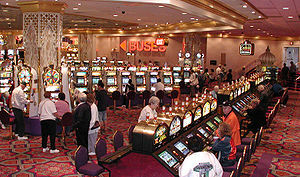 In 1978 in an effort to improve the economy in New Jersey, Atlantic City opened the first legal casino in the eastern part of the United States. This meant that people throughout New England and the eastern states could now easily drive to Atlantic City and enjoy a vacation including being able to legally gamble. By 1988 the Indian Gaming Regulatory Act was passed by the US Congress and Native American Indian tribes were allowed to establish legal gambling casinos on their reservations. Now gambling of some kind is allowed in 48 of the United States, while only Utah and Hawaii allow no gambling of any kind. Have you been to a casino recently? If so, you may have noticed that many of those enjoying the slot machines, playing poker or playing bingo or keno are "retired" senior citizens. They may live close enough to easily drive to the casino or they may go on a bus trip outing offered by their church or other social organization. For example, if you live in one of the New York City boroughs there are round-trip daily bus tours to Atlantic City for about $35 per person. At a recent educational workshop for older adults held this past week in Pennsylvania it was pointed out that 4 percent of the U.S. population has a serious gambling problem; 1 percent of adults (2 million) meet the criteria for pathological gambling. Additionally, Elizabeth Lanza, the director of the Office of Compulsive and Problem Gambling offered: "We have seen problem gambling become a problem among older adults. Retirees are going through their savings, and when it's gone, they realize they have no working years left. Although no substance is ingested, the problem gambler gets the same effect from gambling as someone else might get from taking a tranquilizer or having a drink."